Keyhole provides a sentiment analysis on the Dashboard of your Hashtag & Keyword tracker. It will look like the screenshot below. 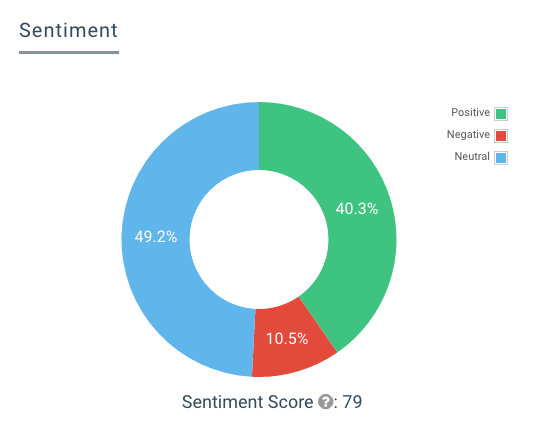 The sentiment score is calculated by positive and negative posts only. Sentiment can be filtered based on posts in the Posts tab, which will look like the screenshot below. Select or deselect emojis to filter posts with the corresponding emoji. On the Posts tab, click on the pen and box button (as seen below) on the right hand side of the post you would like to edit the sentiment of. You can change each posts sentiment to any emoji shown in the "Filter by Sentiment" section.